The Old School LST Waterfowler’s Insulated Drake Jacket is designed with reinforced poly-denier fabric in high-wear and high-stress areas. One example is the lower back area, reinforced to protect the life of the coat when leaning against a tree, or coming into constant contact with the side of a boat, the back of a blind, or the wall of a pit blind. The pocket openings, support panels for the Spring-Open™ Shell Pockets, and the sides of the torso have all been reinforced to stand up to the abuse that all waterfowl hunters face day in and day out. The LST Waterfowler’s Insulated Jacket is a workhorse when it comes to cold-weather hunting. 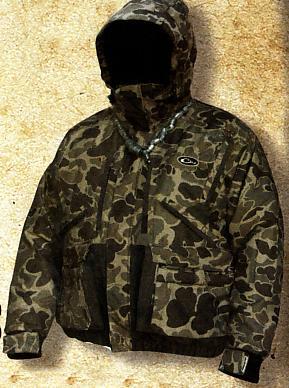 When we set out to design a one-piece, all-in-one hunting coat, we made sure it would raise the bar in waterfowl clothing. This jacket is packed with Instinctive Features pioneered by Drake Waterfowl and upgraded with the little details that make a big difference in performance.